Restoring your boat's finish has never been so smooth! 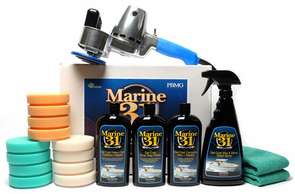 The Cyclo PRO Marine 31 Boat Oxidation Removal Kit includes everything you need to remove oxidation and restore gloss on your boat's gel coat finish. The Cyclo Orbital Polisher 5-Pro is so smooth and easy-to-use you might even restore your dock mate's boat too! For years the American-made Cyclo Polisher has been used by professionals for aircraft polishing. When matched with the ultra-efficient Marine 31 polishes, this machine powers through tough gel coat oxidation without breaking a sweat. To protect the shine you have created, the Cyclo PRO Marine 31 Boat Oxidation Removal Kit includes Marine 31's Carnauba Wax + Sealant and Wax & Shine Detail Spray. These ecologically friendly products will help you keep your boat looking great no matter the seas that lay ahead. Two Pro Guard Backing Plates for quick pad changes are included! Marine 31 Gel Coat Heavy-Cut Oxidation Cleaner is the first step in restoring neglected marine gel coat. Marine 31 Gel Coat Heavy-Cut Oxidation Remover quickly cuts through deep oxidation and removes hull scuffs and scratches from all gel coat surfaces. Proprietary diminishing abrasives work quickly, while Marine 31's advanced lubricant system provides a long buffing cycle and minimal dusting, even in the Florida sun. Use with the included Cyclo Premium Orange Foam Pads to quickly remove oxidation. Cyclo Premium Orange Foam Pads feature a firm construction making them ideal for polishing away scuffs, scratches and oxidation from your boat's gel coat finish. Use these pads with the included Marine 31 Gel Coat Heavy-Cut Oxidation Cleaner to restore a shine to oxidized finishes. These medium-cut green foam pads are ideal for lightly polishing your gel coat finish. When teamed up with the included Marine 31 Gel Coat Final Step Polish they will remove light polishing haze and scuff marks while creating a high-gloss, swirl-free finish that radiates across the bay. The Cyclo Premium White Foam Pads are the softest Cyclo foam pads on the market. They are ideal for laying down uniform coats of Marine 31 Gel Coat Carnauba Wax + Sealant to protect your gel coat from future oxidation. A total retail value of $514.90. You save $49.90!